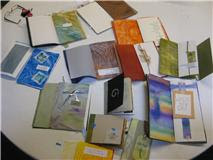 April started out with a wonderful one-day workshop by making books with Marianne Burke. Marianne is a member of our guild who lives in the Kentucky/Cincinnati area, but joins us occasionally for workshops. Marianne is a treasure trove of information for making handmade books and we enjoyed the day putting books together and having completed or almost completed books to take home. Marianne was very generous with her supplies and knowledge. Thanks Marianne for coming to South Bend to teach us. Linda Bravata and Cindy Bowles from Grand Rapids were with MCG members to participate in a workshop called “Card Tricks” on April 16, which was one of the most practical w orkshops I have ever had. You know how we all like to make cards and these gals showed us so many cards to make, it made my head spin! But, as usual, I brought my trusty camera along so that I could revisit the techniques many times when I needed a card for someone. One of my favorites was the watercolor boxes with “thank you” or a message of some sort, and then put on the front of a card. We made several sizes of cards each one being unique. Thanks Linda and Cindy for sharing! On May 14, Angie West took us through the paces of making zentangles. If you don’t know what they are, google zentangles and you will see many interesting designs. We just have so much fun doing new things and adding them to our ever-growing list of art work we like to do. In June, ten members came together at Christ the King Church to re-create the Jackie Sullivan technique. We met at our usual time and created until almost 4 pm. We put on the Jackie Sullivan DVD and played it over and over so we could grasp what Jackie was trying to teach us. Our pieces all look different, but we had a wonderful day working with canvas, watercolor paper, tin foil, cheesecloth, tissue, several Golden mediums and acrylic paints. We love our big room in the front area of the church that has tiled floors and a kitchen for keeping our lunch and having use of the sinks which of course we use a lot of when creating. This room was not available to us on June 4, but Sharon Esmont always finds us another room to use in the church that can accommodate us. We can never thank Sharon or Christ the King Church enough for letting us be a part of their extended congregation. Sharon is always the first on the scene unlocking the doors and getting us to the room we are working in every month. We are truly blessed to be able to use this wonderful facility where we have no stairs to climb and have a short walk to the building. Thanks Sharon!!! I’ve mentioned this before, but it is worth repeating. Working in a school gives me a unique opportunity to go into a classroom and show young children the limitless tools of calligraphy. They are mesmerized with all the different ways they can have their name written and scream for more. In April I went to a third grade classroom and wrote their mom’s name on bookmarks. The teacher was then going to have the students write a poem on the back side of that bookmark and the bookmark would be given as a Mother’s Day gift to their mom or grandma. They are so attentive and responsive to this new form of art they are experiencing and in the long run, we may have some become interested in calligraphy in another 10 years. The cycle must be nurtured to turn children and young adults onto calligraphy. If you have any connection to a school and are comfortable in speaking to students, I encourage you to see all the wide eyes as you create beautiful letters right before their eyes. In addition, after one teacher saw the results, she asked if I was coming to her classroom too…..and of course, I did. Thank you – A big thank you to Angie West, Pat West, Amber Schindler and Lauren Matacio for setting up the pieces at Andrews University. The books and broadsides were beautiful and were showcased at the University library for the month of April. 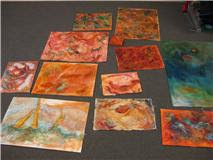 Thanks also to Angie for making all the tags that described the artist and their mediums. Lauren reported that the exhibit was well received. Louise Grunewald – We are excited that Louise can come to South Bend for a workshop on October 29 & 30, 2011 entitled Making Marks. Louise will also give a lecture on Friday night, October 28, at Christ the King Church to tell us how she got started in her artwork. Louise is a talented artist that works in marks and watercolors. This newsletter will announce the beginning of registration for this workshop. Please be aware that only the first 20 checks we receive from participants will be in the classroom with Louise and the rest will be put onto a waiting list. If you are interested in this workshop, please send your check in the full amount of $110/$125 for non members, to Maureen Trubac, MCG - PO Box 11513, South Bend, Indiana 46601. Supply list will be sent to you upon registration. The workshop will be held from 9 am until 5 pm on both days at the South Bend Regional Museum of Art. Please do not delay in signing up for this workshop!! Rosie Kelly – We are hoping to have Rosie come back to South Bend in the fall, date TBA, to teach us another handmade book or pastepaper. Date, cost and supplies to be announced. Annual dues of $15 are due in July. Our annual dues have not changed in many years and are put to good use for supplies for our make it/take it meetings, annual raffle in August, and at the end of the year we give to local charities. Please remember to send your dues to the MCG post office box as soon as possible. The Michiana Calligraphy Guild, based in South Bend, Indiana, is a non-profit organization dedicated to the art and study of calligraphy. One-year memberships are $15.00, renewable each June. Monthly meetings are open to the public and held at Christ the King Church on Cleveland Road in South Bend from 10 am until noon. If ever you have something to add to the newsletter/blog, please contact one of the officers and we will get that information to Amber and Renee. Something you have done, or something you have seen would be welcomed into our information. Pen Dragons – The Pen Dragons of Kalamazoo will be hosting Barbara Close for a workshop on September 17 & 18 and another workshop with Barbara on September 19. Check out her website to see her work: http://www.bcdezigns.com/BCgallery.htm. The Pen Dragons are very warm and welcoming when you are part of their workshops. They usually fill their workshops so if you are interested in being a participant, you may want to consider being a Pen Dragon member to get first dibs! Imagine five colorful autumn days in a spacious and sunlit lodge, nestled in the beautiful northern Michigan woods, on the shores of a crystal clear lake. Now imagine yourself with these same five uninterrupted days (minus kids, dogs, well-meaning spouses and daily obligations) to totally immerse yourself in a stimulating workshop in a great studio space, working anytime day or night that you choose. Leisure activities include kayaking, hiking, and shopping in the nearby towns of Petoskey (on Little Traverse Bay) and Charlevoix, located on the channel connecting beautiful Lake Charlevoix and Lake Michigan. "Vinum scripton reddatur de melion"
Save the best wine for the scribe. Officers – Nominations for officers will be accepted through July. If you would like to be an officer on the board of MCG, please contact Sharon Esmont. Angie West will be stepping down as secretary and we will need to appoint a new person in that position. Please think about being an officer in the MCG. We have several people involved on the board and are always looking for others to help. The rewards are that we communicate with old and new calligraphy members on a regular basis and that in itself is amazing. What a dear friend! Only a friend can make you feel at ease with a no-stress workshop. We felt as if we were visiting as Marianne shared and slowly guided us through her thinking process of developing a book. Think in 3’s! Your color palette should be one main color and two contrasting colors. Gold, white, silver and black can be added in addition. Shape, decorative elements, papers, size, text – these are all the thoughts she pulls together to make her fantastic books. And to think she was able to get us all there, also!! We worked on our design elements by doing a mock up of our book and were enthralled to see these original, gorgeous books come together. The best feature I brought out of this workshop was that Marianne makes up packets of her book materials so that at any given time she only has to grab a packet with the correct colors or shapes and basically letter and bind and voila’ – she’s done! As long as your papers, decorative elements, etc. are out cluttering up your work table, why not cut papers for a book in various sizes, match them with decorative elements, end papers and binding threads – put them in a packet – and have all that pre-planning done. Fantastic!!! Guild in mid-April. It was great! 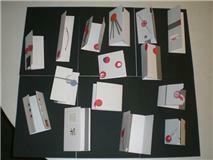 She demonstrated that cards can be made simply and quickly. Our first project was a 15 minute card. We were given three elements with which to make a card in that 15 minute time and many of the samples were so very good. The next card had more elements and a bit more time. After the lunch break, we continued with demonstrations of helpful equipment and for using different paper widths. It was a day filled with new ideas—I usually take a full day to make a card—I really needed this workshop! Linda and Cindy Bowles had many examples. We ended the day with turning squiggles on paper into people, animals and plants, finishing with painting them with watercolors, much as one does when looking at clouds. I have to say that was my favorite part!